There is heightened interest in Network Functions Virtualization (NFV) as carriers push to reduce operating costs and decrease deployment time for new services. SAFplus makes NFV easy by facilitating a gradual transition of your network elements into the new era of virtualization. Legacy equipment doesn’t have to disappear overnight, rather it can migrate into the new world of NFV with SAFplus. New projects can also benefit from using SAFplus from day one. 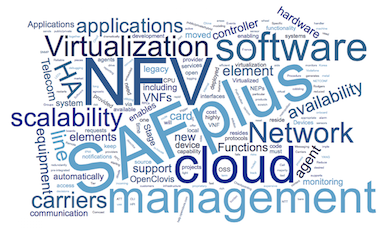 OpenClovis’s SAFplus software enables management services via NETCONF/Yang and High Availability (HA)/scalability in both classical standalone boxes and virtualized applications, or in NFV nomenclature Physical Network Functions (PNFs) and Virtualized Network Functions (VNFs) respectively. This white paper focuses on enabling NFV on network elements/PNFs. For further information on enabling VNFs, or migrating existing applications into the cloud, see SAFplus Enables Virtualized Network Functions. 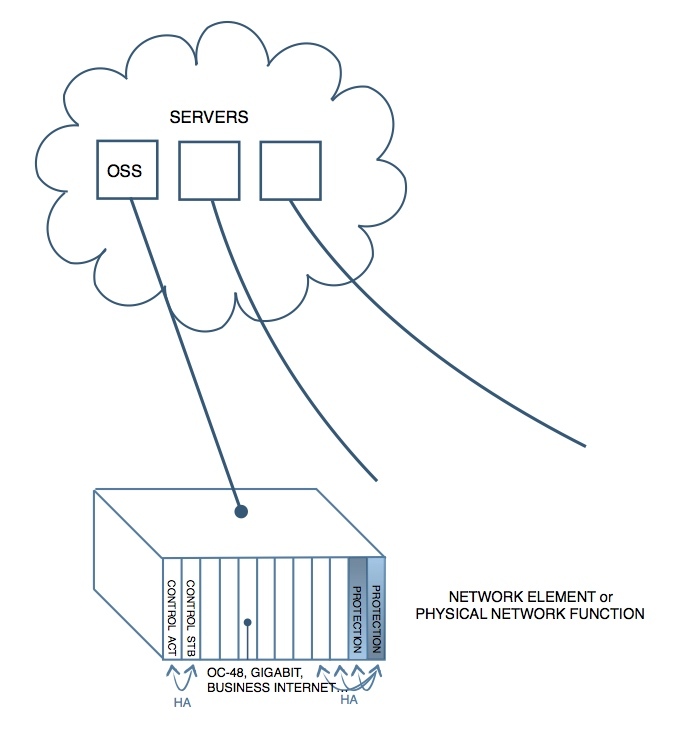 Before the advent of virtualization, Network Equipment Providers (NEPs) predominantly offered their applications on the network element itself, with only the OSS management features centralized. SAFplus enabled, and still enables, HA through line card & system controller card redundancy software, coupled with local application checkpointing. Figure 1. Traditional Network Element Before NFV. In NFV, VNFs join the network element’s OSS in the cloud. Although legacy interfaces may still persist on the device, most of the intelligence resides in the cloud. To ensure resiliency, the NFV agents themselves running on the network equipment must be highly available [No single point of failure Req.4.2.13], otherwise if the equipment goes down no VNFs will be able to access the network equipment. Network elements can evolve to NFV in three stages with the support of SAFplus, as depicted in the figure below. Figure 2. Network Elements with NFV. Stage 1: NFV with legacy network elements: Applications still reside on the network element, but with the addition of an NFV software agent, new applications can also reside in the cloud. 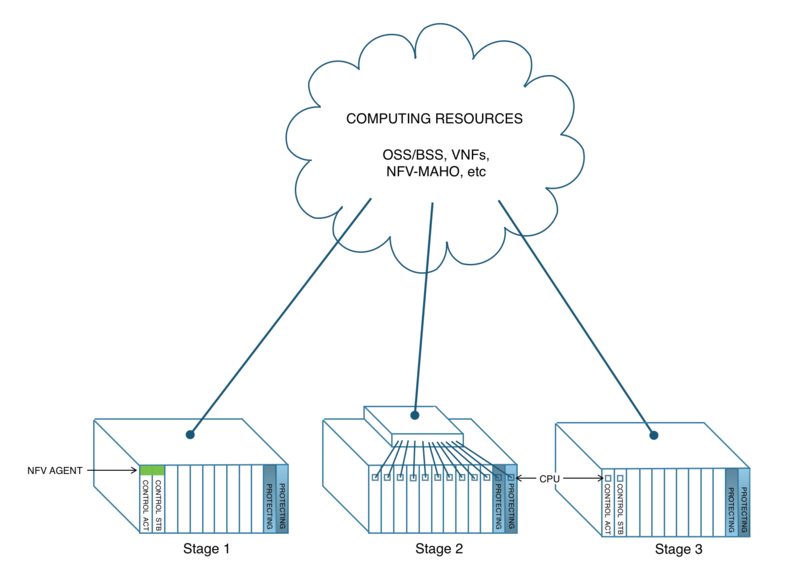 Stage 2: NFV with smart line cards: Applications and all system controller software such as BGP/OSPF routing software, SIP server software, etc have moved to the cloud. The chassis only contains payload line cards, with an independent NFV agent running on each card’s CPU. Stage 3: NFV with dumb line cards: Applications and all system controller software have moved to the cloud. The NFV agent resides on two small, cost effective CPUs, and configures the line cards via standard “hardware” protocols. To fulfill basic NFV requirements, note that in Stage 1 and Stage 3 architectures HA is still required on the control cards, even though many software layers have moved to the cloud, since VNF agent requests must still be highly available. Incidentally, in Stage 1 non compliant equipment can be made complaint by adding SAFplus HA, provided the base hardware has enough capability. Make versus buy: There are inherent risks in starting a development from scratch, or cobbling together pieces from internal legacy code and open source projects. By using OpenClovis time to market and risk will be reduced dramatically – why reinvent the wheel? SAFplus has been deployed by more than 20+ NEPs and into all Tier 1 Carriers including: Verizon, ATT, NTT, Korea Telecom, Vodafone, BT, France Telecom, Reliance Telecom, Comcast, Rodgers, China Telecom. In particular, one of our customers’ products has been deployed into 51 metropolitan areas in the US. Reduce your support burden: The majority of software cost is support, in-house or open source software is expensive long term. Cloud provider agnostic: Some cloud providers do offer a level of virtual machine and software monitoring capability, but by utilizing their proprietary solution you are tied to that provider. SAFplus supports public/private/hybrid clouds and bare metal. SAFplus has rich HA software functionality, including Checkpointing, Events, Groups, and Reliable Messaging. Devices need software monitoring and alarm reporting. SAFplus monitors, restarts, or fails over your software, and also sends notifications to element management systems. Devices need hardware monitoring. SAFplus is pre-integrated with HPI or IPMI sensor access protocols, so onboard sensors can automatically trigger availability decisions and notifications to element management systems. SAFplus can also use these hardware interfaces to reset boards, light LEDs and drive other desired functionality. SAFplus enables fast, efficient RPC (Remote Procedure Call) communication between controller and line cards. RPCs can be automatically routed to the active line card so applications do not have to keep track of availability roles. YANG based modeling is used to describe communication content between VNF applications and the device. SAFplus generates agent code that can be run redundantly in any process or CPU on your embedded device, and can automatically route incoming management requests to the appropriate handler. Push-button NETCONF and SNMP agents are part of SAFplus and support communication to NFV applications in any public/private cloud. Software debugging infrastructure [help.openclovis.com], including logging and a local CLI aids rapid development.